Sunday Photo; Buddhas at Unju Temple – Wake Up and Laugh! Since the South-West corner of the Korean peninsula has fewer and smaller mountains then the East side, a team of heavenly masons came down one night to carve one thousand Buddhas and one thousand stupas. These Buddhas and stupas would balance out the peninsula and save it from capsizing into the sea. However, the rooster crowed, signaling the dawn, before these two were finished, and they still lay in place. I’m interested in how the form of the Buddhas were decided by the shape of the rock, not necessarily by the artist. 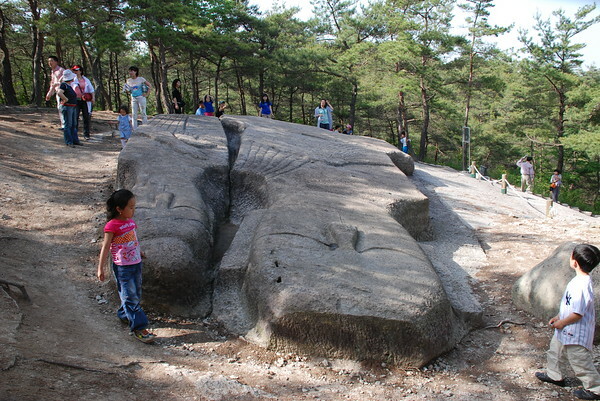 The rock already had the Buddhas within, it just took some chiseling away to reveal them! Thereby giving hope to rockheads like me!